The 100th anniversary of ANZAC Day takes place on 25 April, only a couple of days away. The day was introduced to commemorate the landing of 1,000s of troops from Australia and New Zealand at Gallipoli in Turkey on 25 April 1915. Today ANZAC Day reaches beyond World War 1 – it’s a day to remember all of the ANZAC troops who have fought in wars across the globe during the last 100 years. To mark the occasion I decided to cook my first batch of ANZAC biscuits (shame on me for not getting around to doing so during the last seven years living in Australia). I learnt this week that prior to 1915 ANZAC biscuits were called Soldiers biscuits. The ingredients were deliberately chosen to produce a fuel for soldiers that could be transported by ship and that didn’t spoil quickly or need refrigeration. The bonus today, years later, is that the ingredients are all relatively cheap pantry staples. Why rustic? I decided these would be called ‘Rustic Anzac biscuits’ because my first attempt at any sweet recipe never turns out how it looks in the pictures. As you can see these biscuits were far from perfectly formed! I resisted the temptation to make these biscuits gluten-free but I did eliminate the sugar and added some nuts to boost their health credentials. Having said that I have provided gluten-free and full sugar alternatives. Gluten free? Substitute the flour with gluten-free flour and the oats with quinoa flakes. Crave sugar? Replace the rice malt syrup or stevia with ¾ to 1 cup sugar. Combine the butter and golden syrup/honey in a pan. Heat on a low heat for a few minutes until melted. Add the boiling water to the melted butter mixture. If you’re using plain flour then add the bicarbonate of soda to the water first. Combine the remaining (dry) ingredients in a separate bowl (sifting in the flour). Add the butter mixture to the dry ingredients and combine well with a wooden spoon. Pre-heat the oven to 170C conventional/150C fan, and grease and line two oven trays with baking paper. Roll the mixture into small balls (some recipes recommend a teaspoon sized amount, others suggest a level tablespoon). Place the balls on the trays (at least 3cm apart) then flatten each one into a disc (you can do so with the back of a fork or spoon). Bake for 20 minutes in or until golden. Allow to cool before transferring to a wire rack. Once completely cooled then serve or store. Shortly before I hit publish on this post I saw an impressive recipe from Tanja at The Paddington Foodie. I’ve been drooling over Tanja’s recipes for some time now and her Little Anzac Ripple Cakes made my ordinary Anzac biscuits feel, well, rather ordinary. 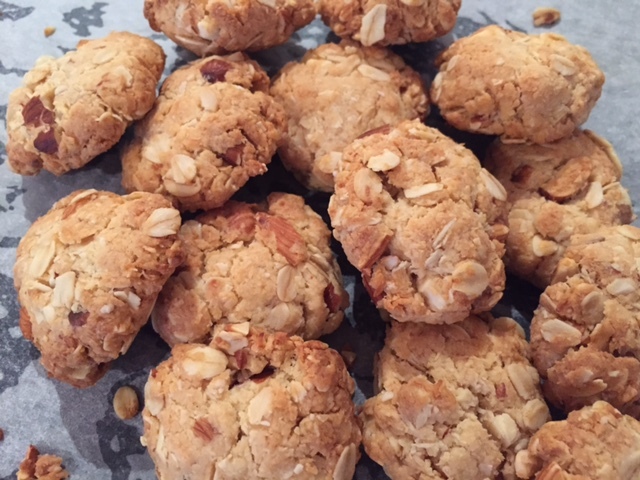 Nevertheless her post uses Anzac biscuits as the base – so if you’re adventurous let Tanja inspire you to take your biscuits to the next level! 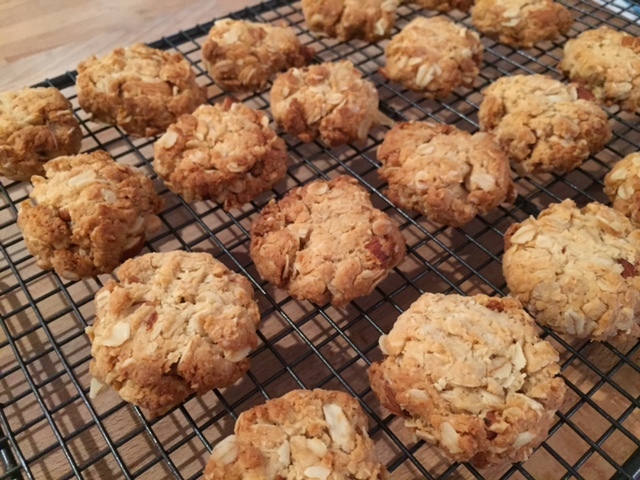 Tags: Anzac, biscuits, gluten free, honey, oats, quinoa, recipe. Bookmark the permalink. Oh my these looks delicious. I really like how the ingredient list is short and simple. Agree – and yet the taste isn’t compromised. Laura these are gorgeous! I love ANZAC biccies, the nubblier and more rustic, the better. My family are chewy ANZAC people so I’ve been working on perfecting my recipe and they still aren’t quite there yet. I’ll have to give yours a try! Thanks Jenn and such funny timing – I was just starting to read your espresso post when I realised my dinner is ready…will be sure to finish it tomorrow! These looks wonderful! thanks for sharing and for a little bit of history! Thanks – they are – or I should say they ‘were’ as the last few were finished on Sunday night – they didn’t last long at all!